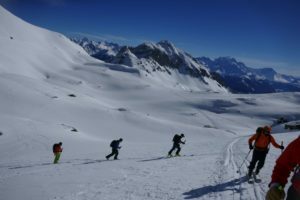 The world famous 18km journey with 2800m of vertical descent through some of the most stunning glaciated alpine scenery rarely disappoints! 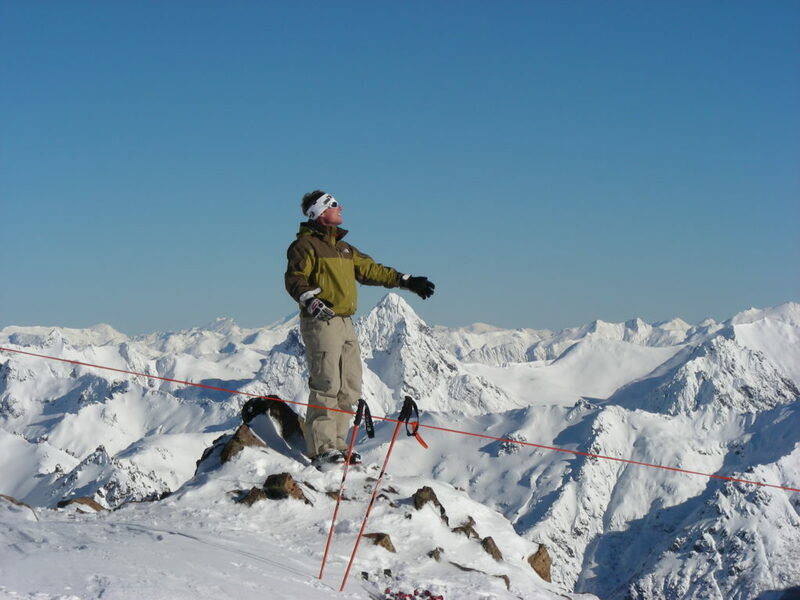 This magnificent ski journey can be done in a short day by confident black slope skiers. 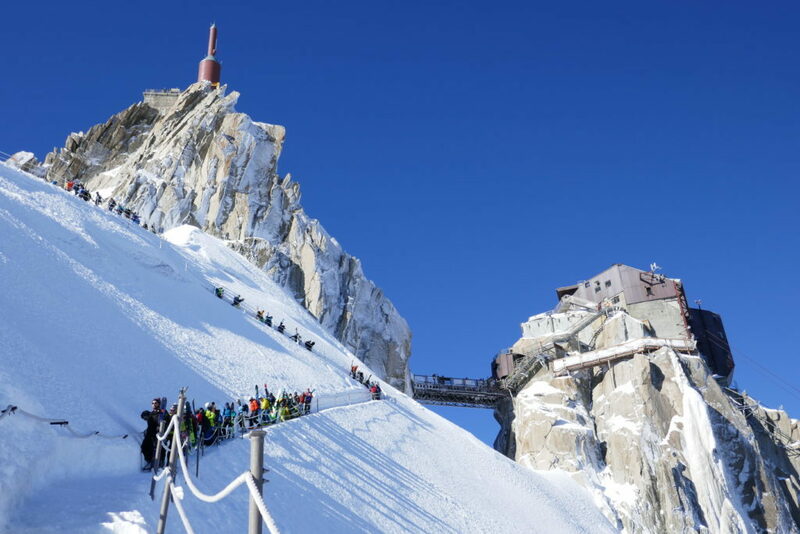 Thanks to the height gain (2742m) given by the Aiguille du Midi cable car. 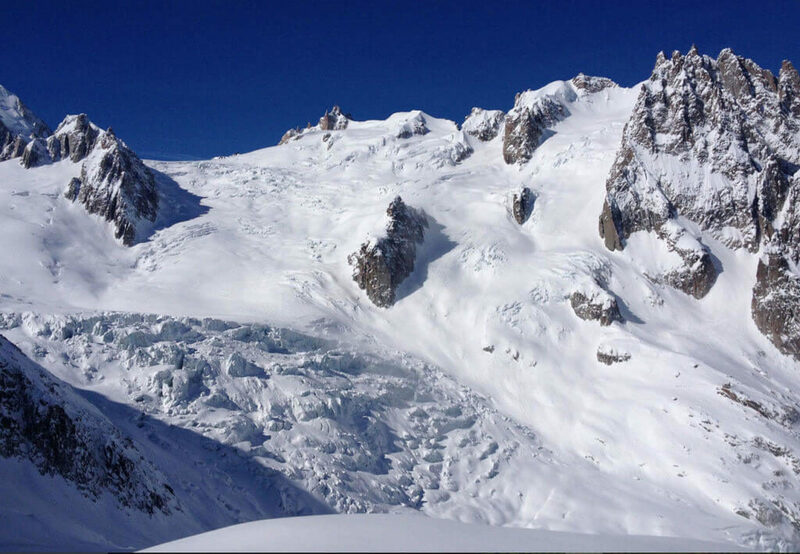 The descent of the Vallee Blanche is often the highlight of a ski trip to Chamonix! 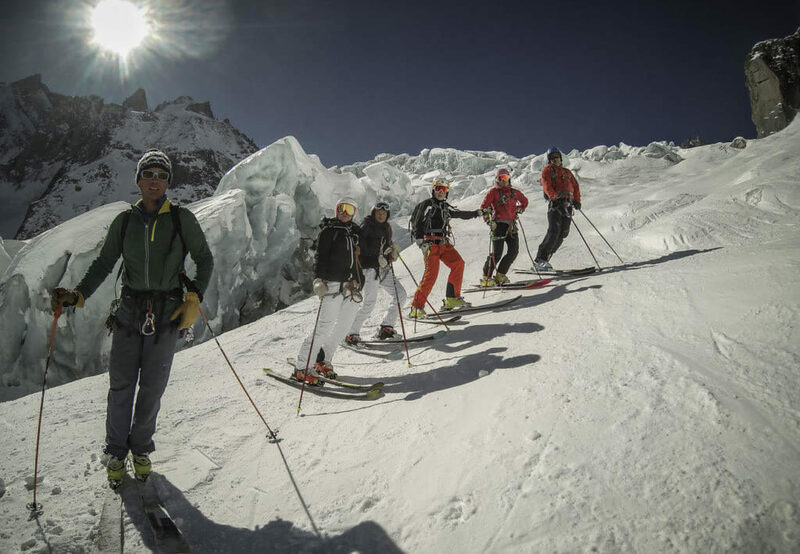 We provide fully qualified (IFMGA) Mountain Guides who work hard to ensure, that you have a safe, enjoyable and interesting descent. We are also able to offer interesting variations on the descent. Would you like to choose steeper lines? 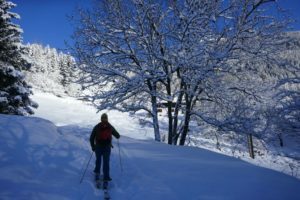 Or include a short ski tour across to the Italian side before skiing down the classic route to Chamonix. 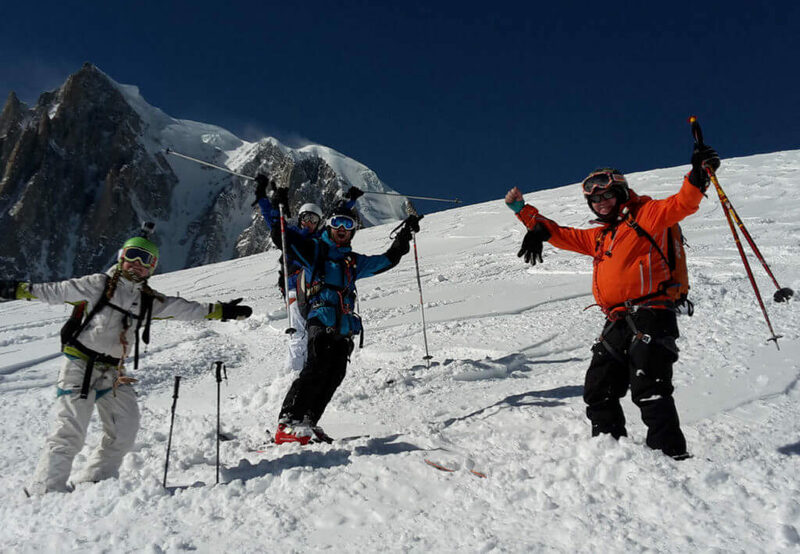 If you ski confidently on a black slope you will be ready for THE Vallee Blanche with us! 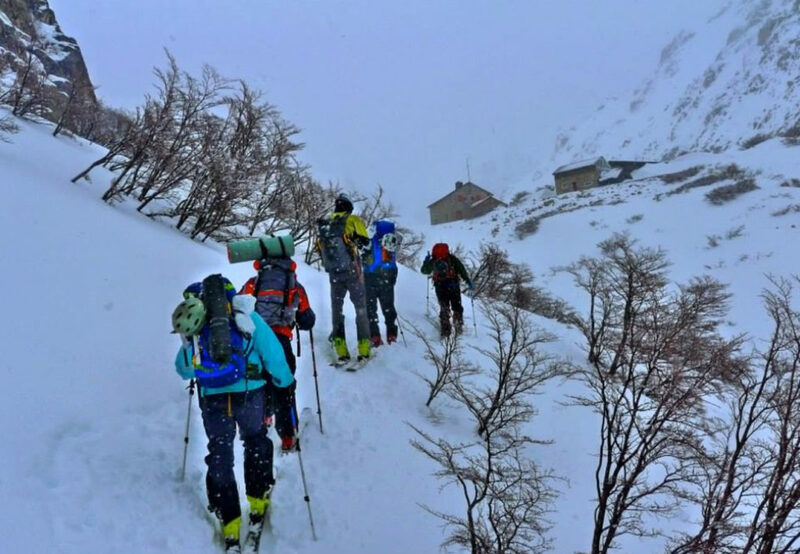 Included in the Price: UIAGM / IFMGA mountain guide – a fully qualified and experienced Patagoniatiptop guide will accompany you, we provide you with an avalanche beacon and harness. 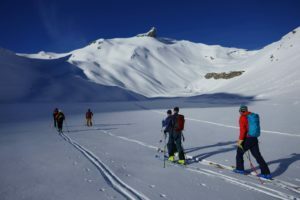 If the weather or snow conditions are not suitable to ski the Vallee Blanche, we will not cancel the trip but follow an alternative off-piste skiing program. 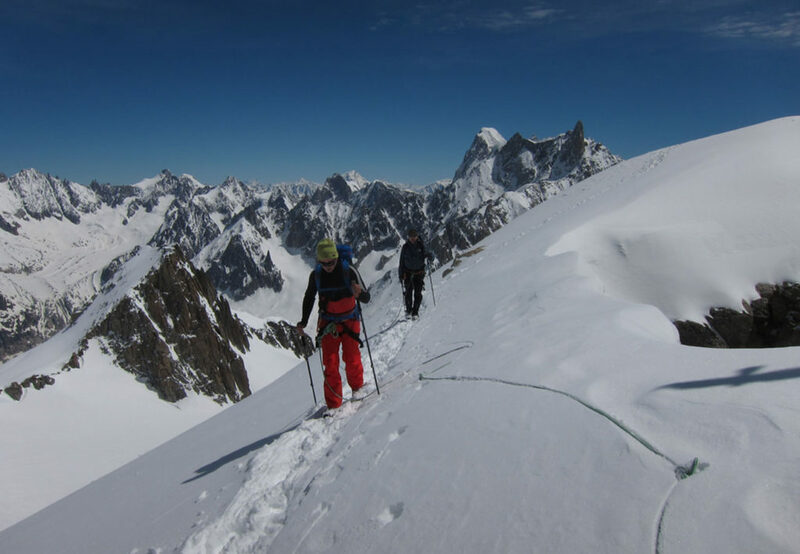 Chamonix offers perfect terrain for a guided off-piste skiing day. 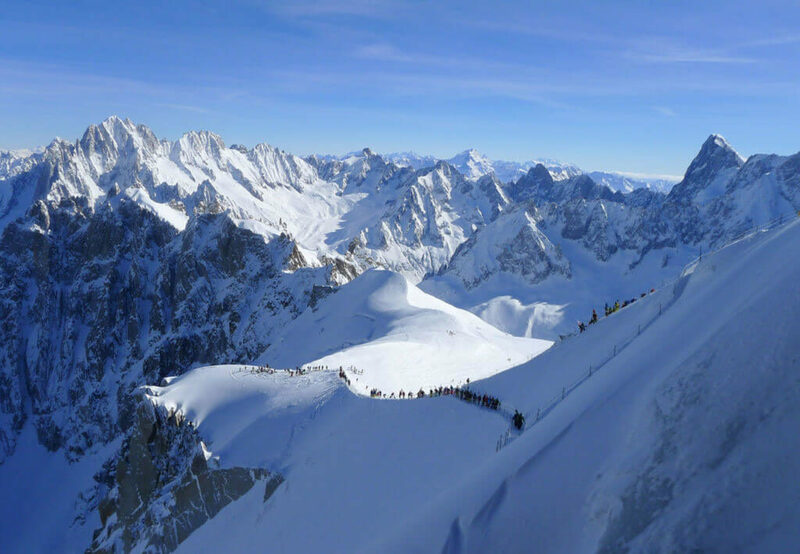 A lift pass to access the Aiguille du Midi cable car and the Montenvers train is needed, the Mont Blanc Unlimited is the best option as it covers both. 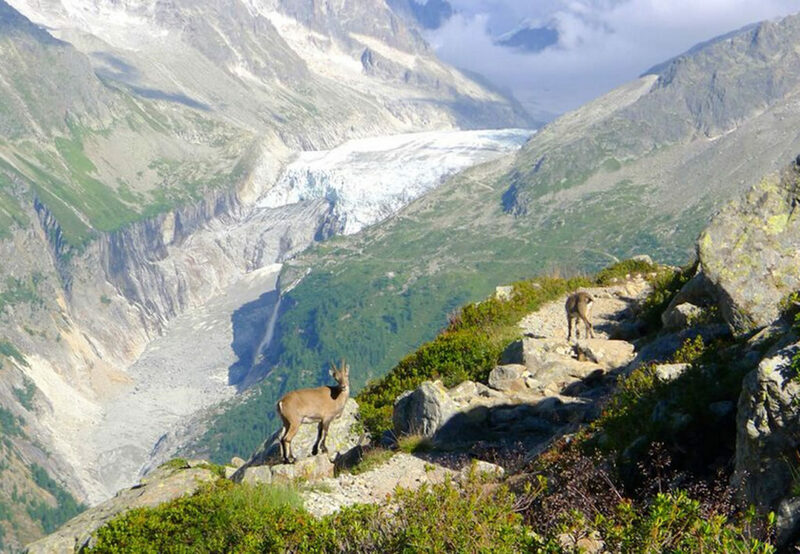 This short trip is perfect for hikers that like to enjoy stunning views over the Mont Blanc mountain chain, sleep in two mountain huts and spot some ibex and wildflowers along the way. 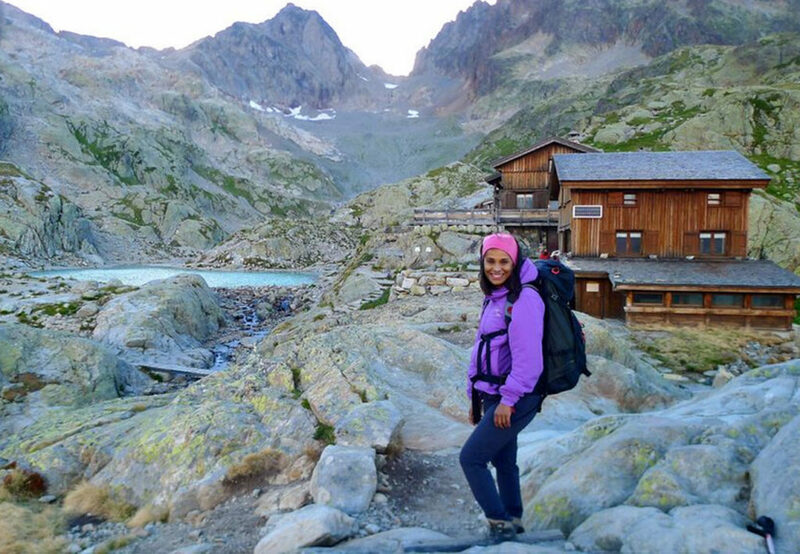 Your local guide makes sure that you will get to the huts just in time to enjoy a delicious mountain dish and that you don’t have to worry about anything but taking the nicest pictures of the famous Lac Blanc mountain lake. 19.00: Information and meeting at the hotel. 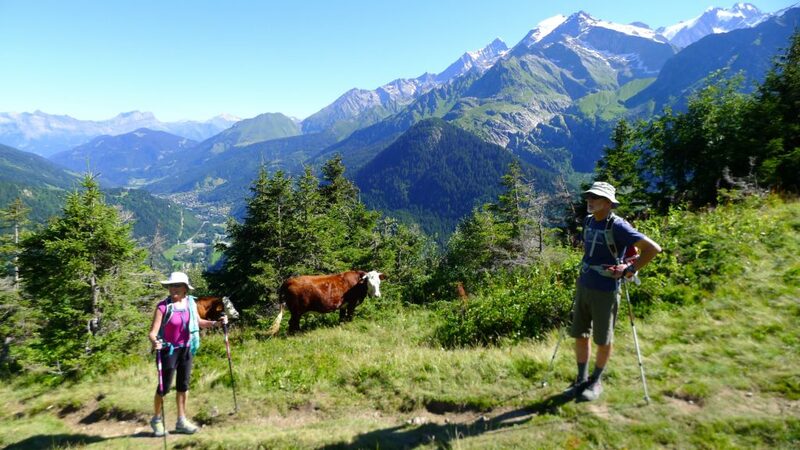 We hike from Chamonix up to the Refuge Bellachat (2152m). 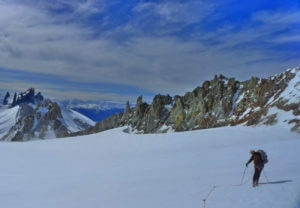 The Refuge offers one of the nicest views over the Mont Blanc mountain chain. You might want to enjoy a drink on the terrace that overlooks the whole Mont Blanc valley and wait until the sunset puts the mountains in a pink coat. The family style dinners will soon be served in the cosy mountain hut. An early breakfast at the mountain hut with the fantastic views towards Mont Blanc. 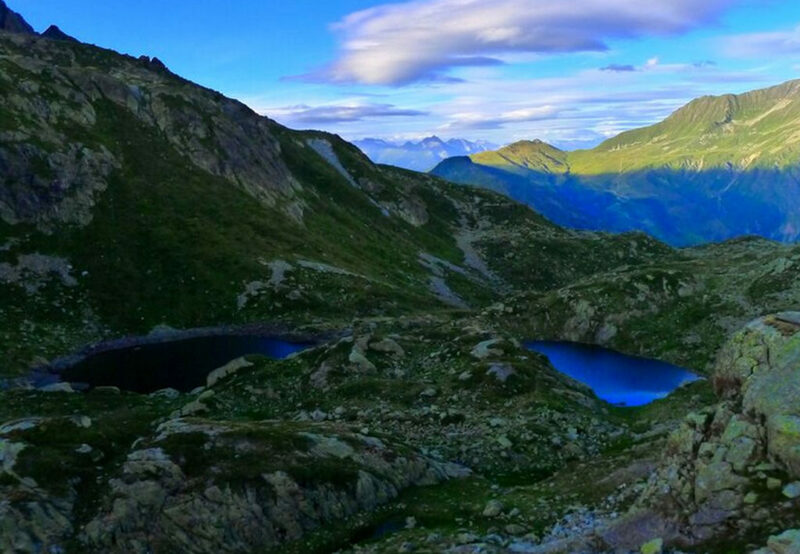 Our trail brings us up to Brevent summit for an even more breathtaking view. We reach Col du Cornu via the Col du Brévent and traverse to the Lac de Cornu (at 2276m), which is situated in of the most beautiful environments in the valley. 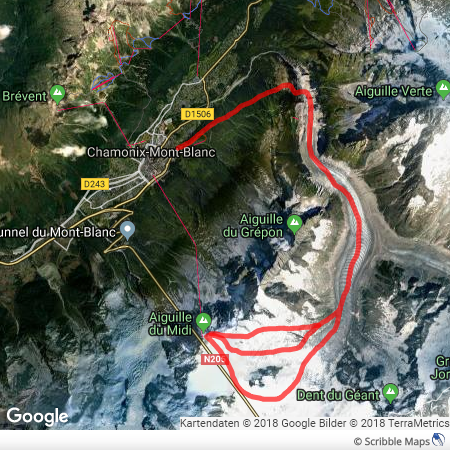 After a picknick lunch we continue the descent through the Combe de la Glieres and hike up to the mountain hut Lac Blanc (2353m). The Lac Blanc mountain lake is the perfect location to take some stunning pictures of a perfect mountain scenery with the Mont Blanc in the back. We eat a good breakfast overlooking the Aguilles Rouges mountain before leaving this beautiful spot. 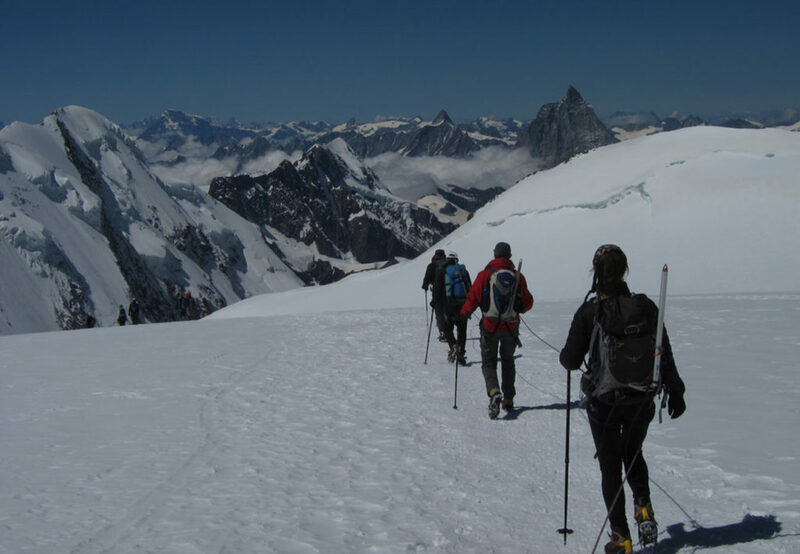 Our way down to Argentière will take us to the Lac Cheserys and either Argentière or the Col du Montets. 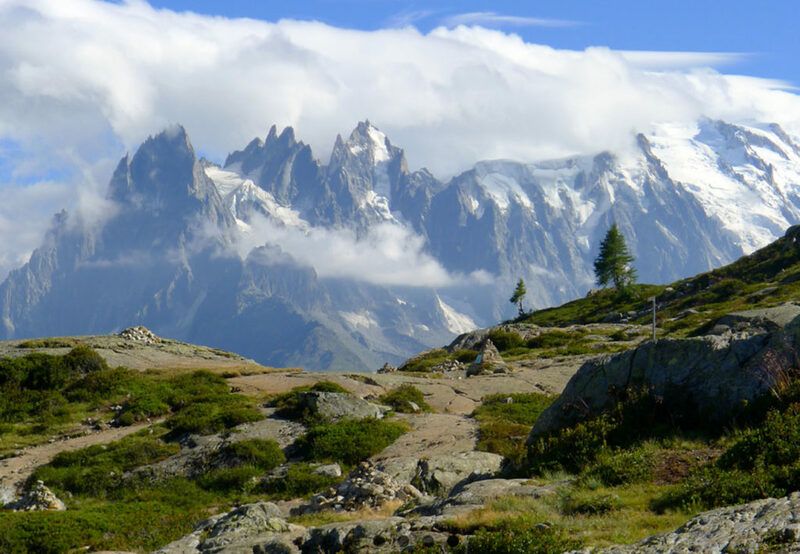 Those that want to hike a bit longer can join the guide on the Petit Balcon Sud all the way back to Chamonix. Lunch will be served at local restaurant in the famous ski resort of Argentière. In Cornwall we will discover landscapes where the sea turns turquoise in the sun, the sand is white and the natural light is sometimes blindingly bright, the land is adorned with a legacy of Bronze age standing stones. Huge granite burial chambers, Celtic crosses and holy wells. We will walk trough beautiful flower fields along the South Western Coast Path and might spot some seals on the way. 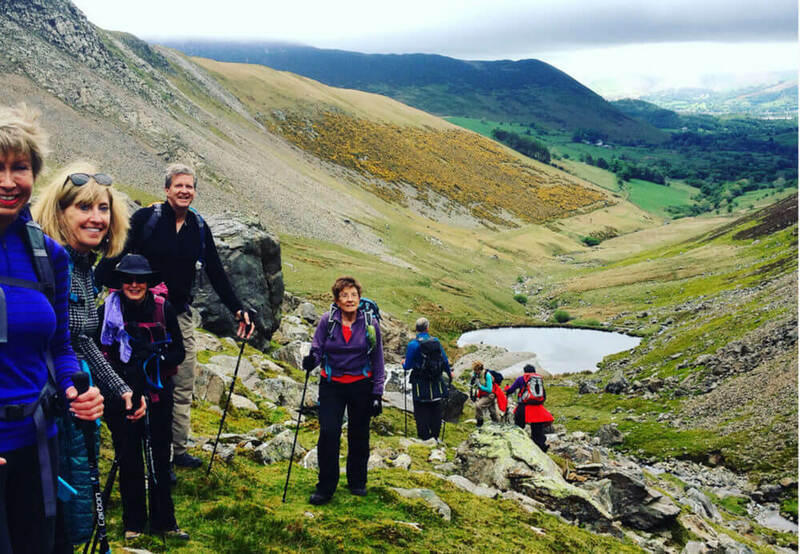 Walking on the Fells in the Lake District National Park is something every walker should experience. 500 million years of geological processes have produced a tightly packed landscape of sparkling waters and superb rugged peaks of dramatic beauty. Within an area only 30 miles across, England’s highest mountains tower over its deepest and longest lakes, with picturesque stone-built villages, farms and country inns crowding into the valleys. You will stay at the magnificently sited Mullion Cove Hotel for the next two nights. The hotel is situated on the Lizard Peninsula in South Cornwall. The hotel stands on the cliff top overlooking the harbour and fishing cove with uninterrupted sea views. There will be time for a short walk before dinner. Today we’ll take our first long hike along the Cornish coast, directly from the hotel on the South West Coast Path. We’ll visit the dramatic Kynance Cove and Lizard Point, before proceeding to the pretty village of Cadgwith for a welcome pint! 10 miles, 2000 feet of ascent and descent. 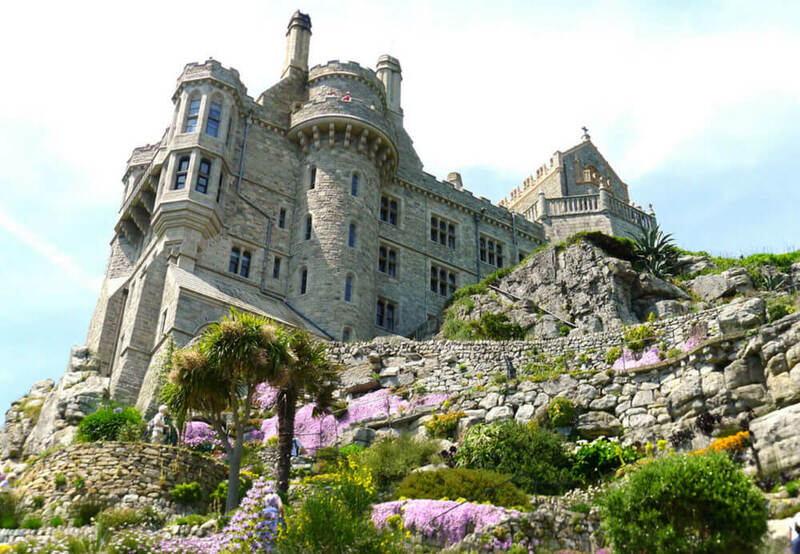 Today we’ll start very early to fit in a visit to iconic St Michael’s Mount and its 17th Century Castle, with access by its cobbled tidal causeway. If the tide is high, transfer is by small boat. 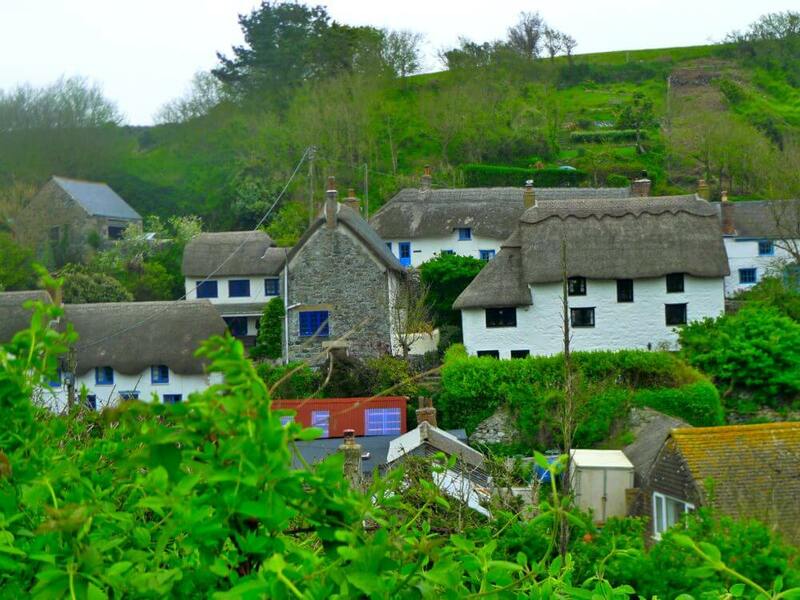 After that we can transfer to the little village of Porthcurno and hike along the South West Coast Path to Land’s End admiring the views from the most westerly point of the English mainland. 6 miles, 2000 feet of ascent and descent. Today you will hike from Lelant to Zennor. 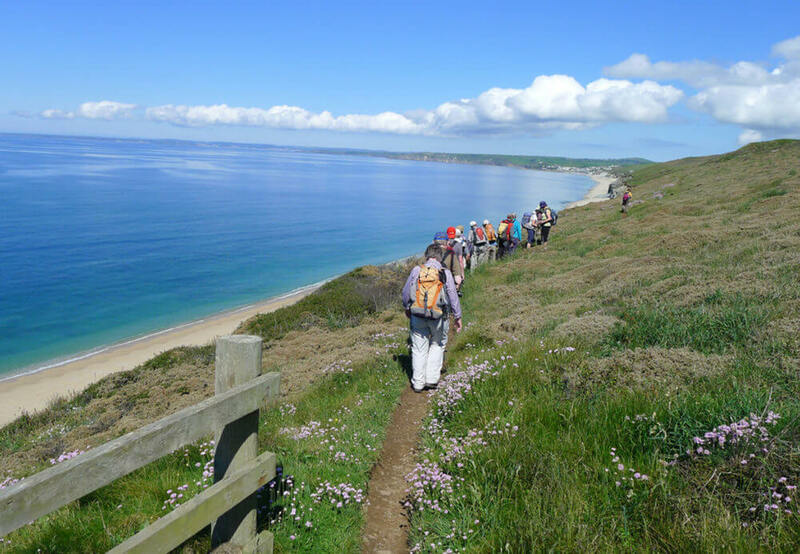 Again we follow the South West Coast Path through wonderful coastal scenery through areas of wild orchids, with views down to rocky inlets where the seals will be resting. An option today is to finish the walk in St.Ives to allow more time to shop and sightsee there. Otherwise the hike finishes in Zennor. Using the train, allows the choice of length of stay in St.Ives and the journey takes just 10 minutes. 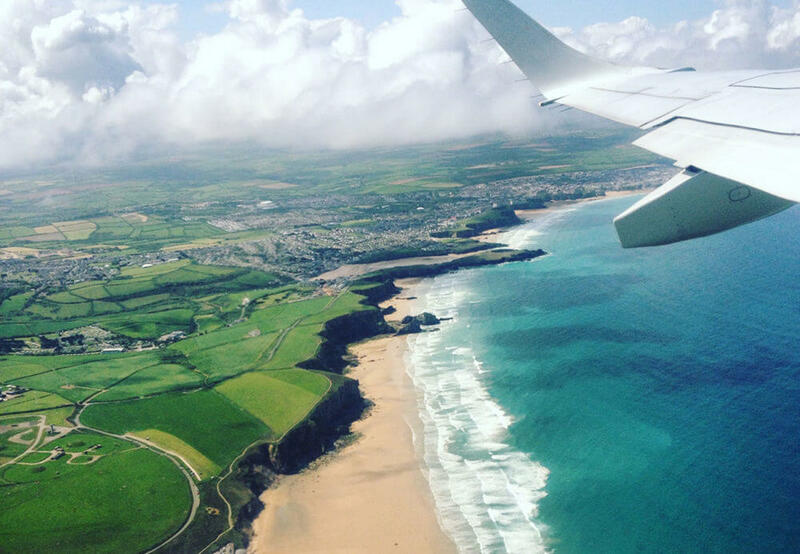 Today you will transfer by private minibus to Newquay airport and again transfer to the Lake District by private minibus from Manchester airport. Depending on flight times, we should have time for a little hike up Hampsfell and a visit to the picture postcard village of Cartmel, famous for its races, sticky toffee pudding and its priory, before reaching our hotel, The Swan at Newby Bridge. Today, we’ll attempt an iconic British hike, to the top of England’s highest fell, Sca Fell Pike. The hike starts in Brotherilked, we go up past the waterfalls of Scale Gill and the River Esk, to magnificent Great Moss. From there we make a final ascent of Sca Fell Pike via Micklesore, and then descend steeply down the path by Lingmell Gill enjoying views over Wastwater. A short hop by minibus brings us to the Wastwater Hotel with its famous hikers bar. A long, but very rewarding day. 8 miles, 3100 feet in ascent and descent on rocky and uneven Lakeland paths with some steep sections. Today’s we’ll enjoy a shorter hike as we transfer to the North Lake District. Starting in Rydal Water on the coffin route, we’ll ascend little Loughrigg Fell high above pretty Rydal Water. We’ll then descend to Loughrigg Terrace where the bluebells will greet us before crossing over to White Moss and Wordsworth’s house. It is possible to have a guided tour of Wordsworth’s house, a fascinating insight into 18th century domestic life, as well as the great poet. Grasmere village itself is a picture postcard of pretty slate houses, shops and pubs. Your hotel tonight is Armathwaite Hall and Spa, where you will have dinner. Today we will drive into the heart of the Newlands Valley to Little Town, the starting poing of one of the Lake District’s most famous hikes, The Newlands Round. First we will ascend the spectacular wide ridge of Hindscarth to reach Dale Head and one of the best views in the Lake District over Buttermere and Crummock Water. From here we will descend over Maiden Moor down to beautiful Derwentwater and the jetty at Brandlehow. You will then catch the Victorian steam launch across the lake to the market town of Keswick, where there are plenty of shops and cafes, before catching your private minibus home, via the ancient stone circle of Castle Rigg. 9 miles, 2900 feet in ascent, 2400 feet in ascent, on rocky and uneven Lakeland paths. Some steep sections. Your dinner tonight will be at Armathwaite Hall. 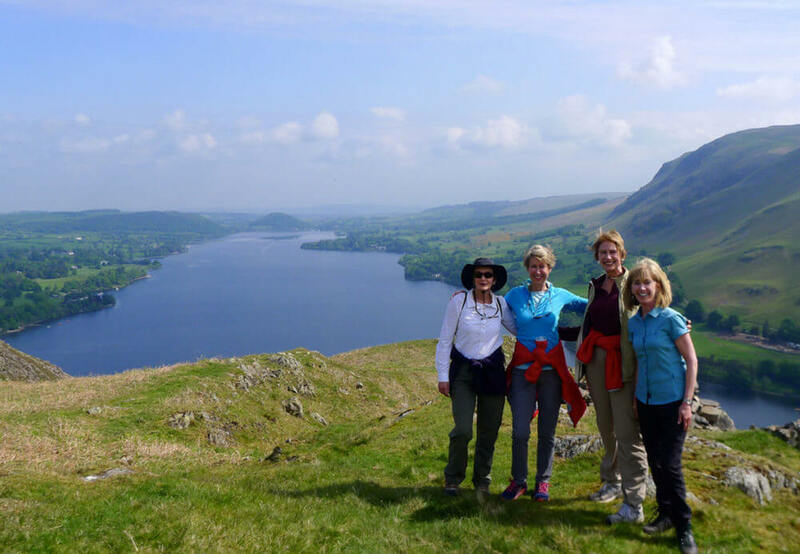 Today you will transfer to Pooley Bridge to catch another Victorian steamer and enjoy a trip down the deepest lake in England, Ullswater. You will enjoy a gentle walk along the shores to the pub in Patterdale. There a private minbus will transfer you to Penrith station for your First Class train journey back to London. 5.7 miles, 1100 feet in ascent and descent. 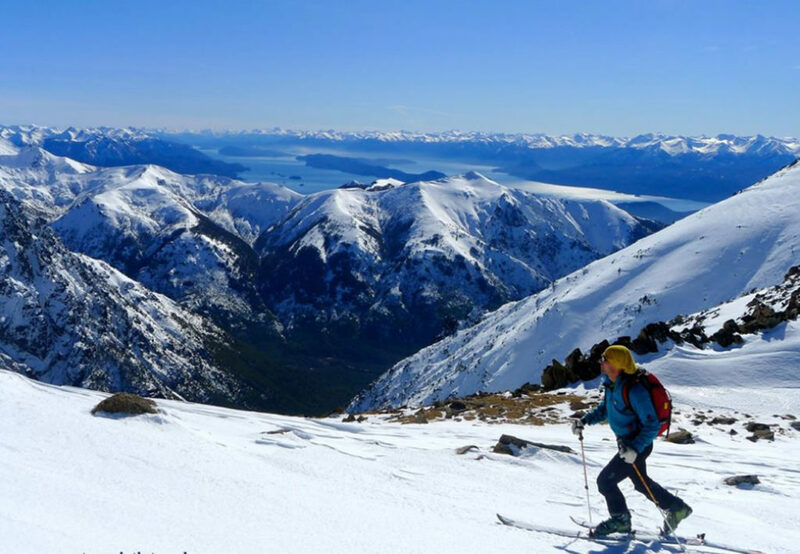 Ski Chile and Argentina with us! 7-14 days programs available. Tailor maid for you. When the days start to get shorter in the northern hemisphere, spring is slowly waking up in Patagonia. 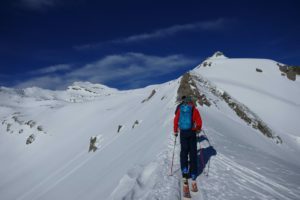 For the ski touring fans this means corn and sometimes powder snow skiing under the south american sun. 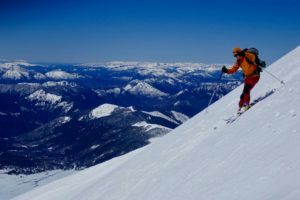 Some experts speak about the best spring skiing in the world. 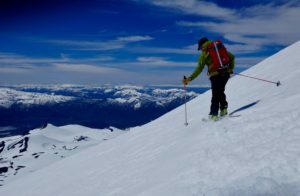 All our ski touring goals between Bariloche and Temuco are between 2000 and 3000 meters high and no long acclimatization is necessary. 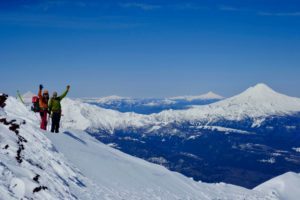 Our skiing adventure starts in Bariloche Argentina or in Temuco Chile airport and ends in either of both, depending on the itinerary you choose. We can offer a round trip or also a point to point trip. Bariloche is situated in the northern part of Argentina’s Patagonia in the Nahuel Huapi National Park. 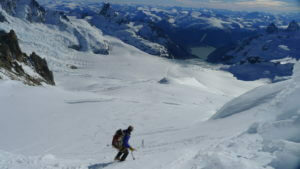 There are great ski touring options around the so called “Switzerland of south America” in the Patagonian Lake District. The incredible views down to the huge lakes and rainforests are stunning. 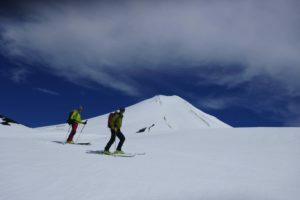 After the amazing volcano-skiing in Chiles “small south” where we ski volcanos like Casablanca, Osorno and Villarica we cross the boarder into Argentinas lake basin. 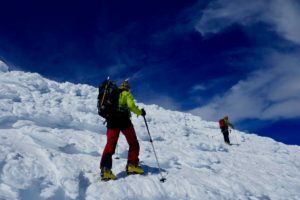 We choose those volcanos and mountains with the best conditions at the moment we are there. (There are about 10 volcanos to choose from). To relax between the tours, we take you to some of the worlds best hot springs in hidden valleys and eat great seafood as well as Argentine beef. 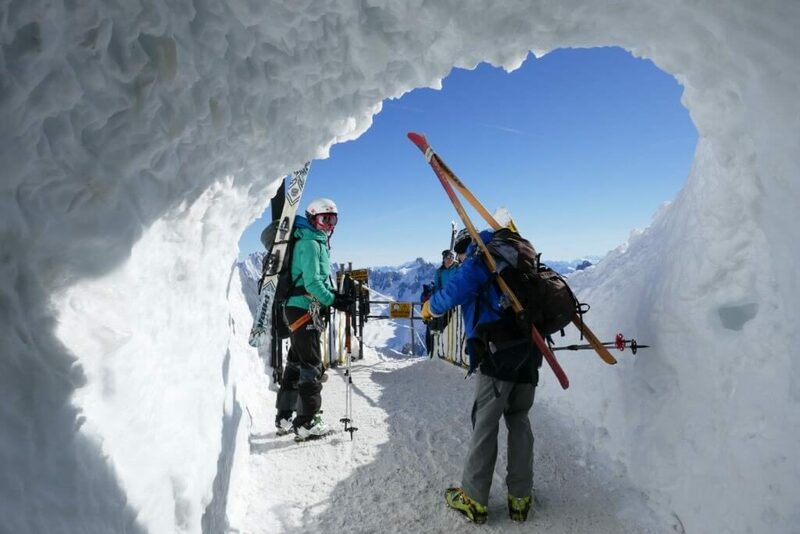 Come join us on this exotic skiing adventure! Your mountain guide picks you up at the airport and drives you to the foot of the volcano Lonquimay. Our first volcano, Lonquimay is surrounded by very old Araucaria trees and is perfect for a start into the Volcano-tour. Llaima is one of the biggest volcanos in this area and stands in the Conguillio National park. It’s name means “the reawakened” in Mapuche language, the language of the local people. We use this day to relax and reload our batteries. The Pozones hot springs is the perfect spot to relax and enjoy nature. Pucon is one of Chiles favorite outdoor destination, a small vibrant town on the foot of Villarica vulcano. We spend the evening and night here. A short drive up into the Villarica national park. 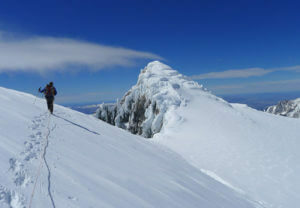 Today we will climb the 2847m high volcano Villarica. 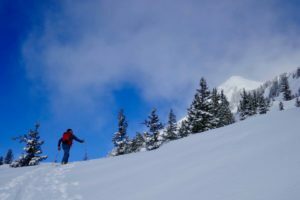 The long ascend is very much worth it: a view in to the bubbling Magma in the crater and a great downhill run on the slopes up to 35° back down to the car. A magical relax day! This natural hot springs have an idyllic setting between the mountains. There are several pools with varying temperature for personal selection. The setting is very natural and quiet. After soaking our muscles we continue the drive into the Huilo Huilo natural reserve where we can discover the Valdivian rainforest. The Mocho-Choshuenco volcano lies directly behind our Hotel, we cross the Huilo Huilo river with it’s clear blue water and skin up trough the rain forest to the top of this twin volcano. After the tour we drive down south into Chiles Lake District and to the beautiful Llanquihue. Maybe the most perfect conical shaped volcano on the tour. We reach it after a short drive around Llanquihue lake, Chiles biggest sweet water lake. From the top we will be able to overlook the whole lake basin and all the way to the Fjords near Puerto Montt. A short drive brings us to Antillanca and it’s hot springs near the Argentine boarder. Casablanca or the whit house is our last volcano in Chile. Easy to reach from the Antillanca ski area. 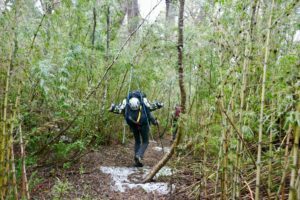 We walk up to Refugio Puyehue trough thick Valdivian rainforest. 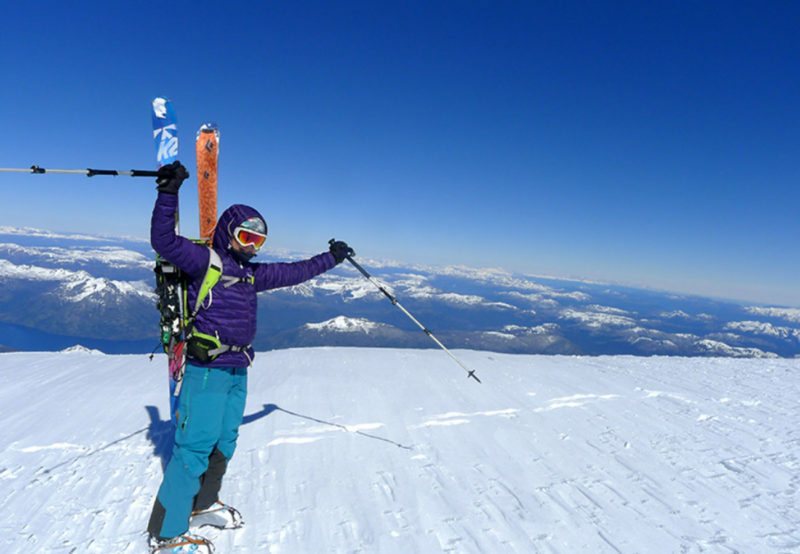 Skitour up to Volcano Puyehue where we’ll be able to overlook the huge crater. Ski back down. We drive over the boarder into Argentina today and enjoy a relaxing afternoon in Bariloche. We hike up to Refugio Meiling from the hamlet of Pampa Linda. It takes a 1.5hr drive from Bariloche trough the Nahuel Huapi National Park and along the pale blue Gutierrez and Mascardi lakes. We first hike trough a forest and skin up reaching the hut at the foot of the glacier. We start early this morning after a breakfast at the hut. We skin up over big, wide glaciers to the Blanco Pass. 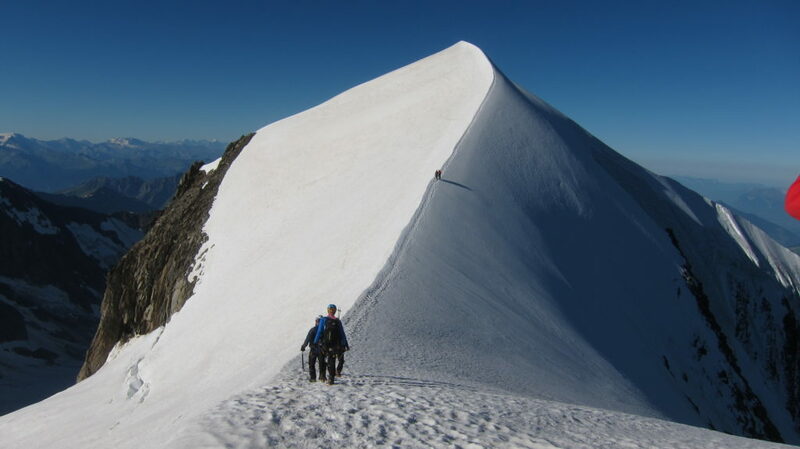 The last part to the summit gets a bit steeper, but no climbing techniques are required. Ready for an unforgettable ski run down? Please contact us for programs and prices tailored to your wishes! Take a 2 hours flight from Buenos Aires, the capital of Argentina. Take a 2 hours flight from Santiago de Chile, the capital of Chile. Patagonia is the scene of the world’s great adventures. Even if you know little of the place, the name itself inhabits our subconscious, whispering of an unknown finger of the earth, el fin del mundo. You picture large silent spaces and windblown solitude. The first Europeans to lay eyes on this landscape were led by Ferdinand Magellan, who pioneered passage trough the treacherous strait that now bears his name. His expedition named the mainland “Tierra de los Patagones” unwittingly spawning the myth of a race of Patagonian giants. To the east of the Patagonian Andes, the pampa is an immense desert, by some accounts among the five largest deserts in the world. West of the Andes is another world. Here both the Central Valley and the Coast Range have sunk into the Pacific; what were once glacial valleys are now fjords, and what were once mountaintops ar now islands. Hotsprings lay revealed by coastal erosion while great glaciers further fragment the landscape, necessitating maritime or air travel. Great forests cloak the Andes from the Pacific shoreline to the continental divide, bisected by surging emerald rivers carrying glacial silt to the sea and providing habitat for fearless trout and salmon. Volcanoes have always fascinated me. If they are also suitable for skiing and produce hot thermal water, they offer a perfect experience. In the Chilean-Argentine Lake District there are about twenty volcanoes that form part of the Pacific Ring of Fire. The snow-white volcanoes, perfectly conical in shape, are a string of pearls. They tower high above the green meadows, primeval forests and crystal-clear rivers. The lolak Mapuche Indians called them Pillan or “firehouses”. Pillan is the name for a powerful, extraordinary, powerful and sinister appearance. Even today they still try to conjure up the spirits in the volcanoes with the help of ancient rituals. The Mapuche are considered to be the worst-humoured, proudest Indians in South America. in battle. Rumour has it that the Mapuche poured glowing liquid gold into his throat. Also in the following time the Indians successfully prevented a further colonization of Chile. The ongoing resistance of the indigenous people was so successful that in 1641 the Spanish had to recognise the Mapuche nation as an independent territory in a treaty, a unique process in the history of South America. So the persistently bad mood for the Mapuche paid off. Unlike most Indian peoples, they survived colonization. 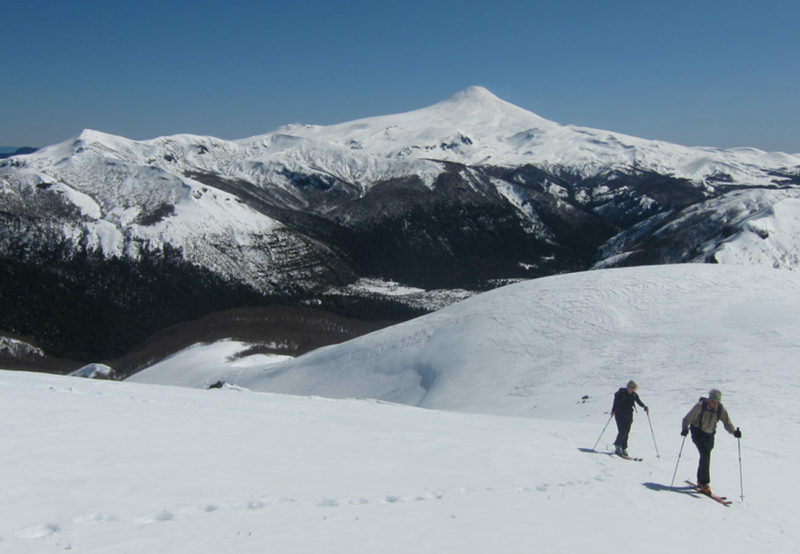 In Temuco, where volcanic forces have created fascinating lunar landscapes over thousands of years, where remote mountain lakes glow and thermal springs gush, where thousand-year-old primeval forests with araucaria and southern beeches have been preserved – this is where our ski tours begin. At the foot of the Lonquimay volcano we spend the night in a quiet lodge. 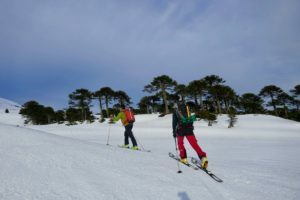 The next morning we drive to the ski resort of Corralco, and put the skins on our skis. 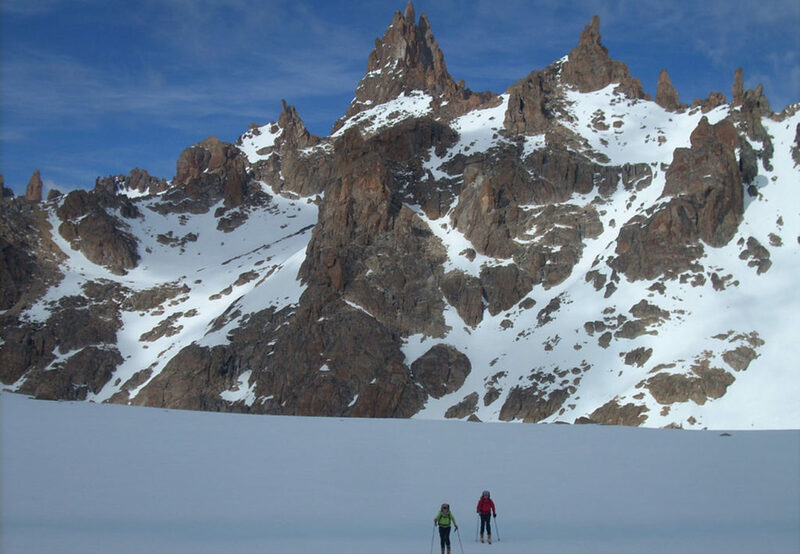 The Lonquimay with its 2865m is the perfect entry mountain into our ski adventure. After an ascent of 1362m we stand on its ridge and enjoy the wonderful view of the surrounding volcanoes. We can already have a look at the volcano Llaima, our summit destination tomorrow. In the afternoon we enjoy the warm spring sun in the garden of our lodge. The neighbours invite us for a typical dinner. We can try the yellow Llao Llao mushrooms, which grow on the native Andean beeches, pasta from the nuts of the Araucaria and fresh trout from the river. The next morning we drive into the Conguigilo National Park on a bumpy natural road, freshly strengthened. The snow line is exactly at our starting point and so we can start with the skins from the car. Through the lively araucaria trees we go up to the steeper slopes of the Llaimas. It is one of the highest and most active volcanoes in the area. 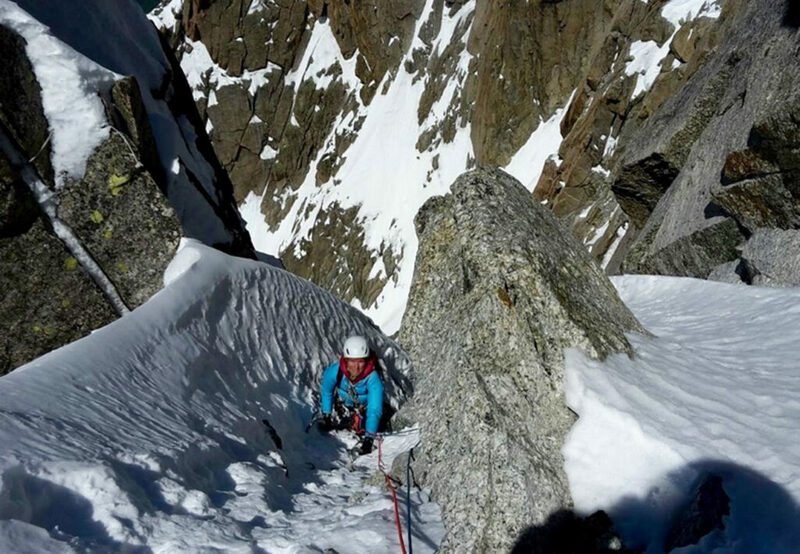 We deposit the skis 300m below the summit and climb the last meters with crampons. Again and again it steams from holes filled with avalanche stones. A bizarre contrast to the frozen snow through which we find our way to the summit. Also on the summit there is a mixture of ice and warm, steaming avalanche stones in all colours. A great descent brings us back down to our pick-up. A cold beer which we put in the lagoon tastes very good. 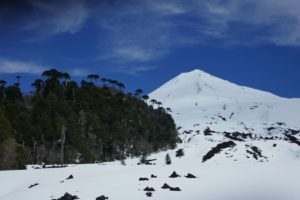 We drive around the Llaima and after a three-hour drive in the south through forests, small villages and green meadows we reach the big Villarica lake. 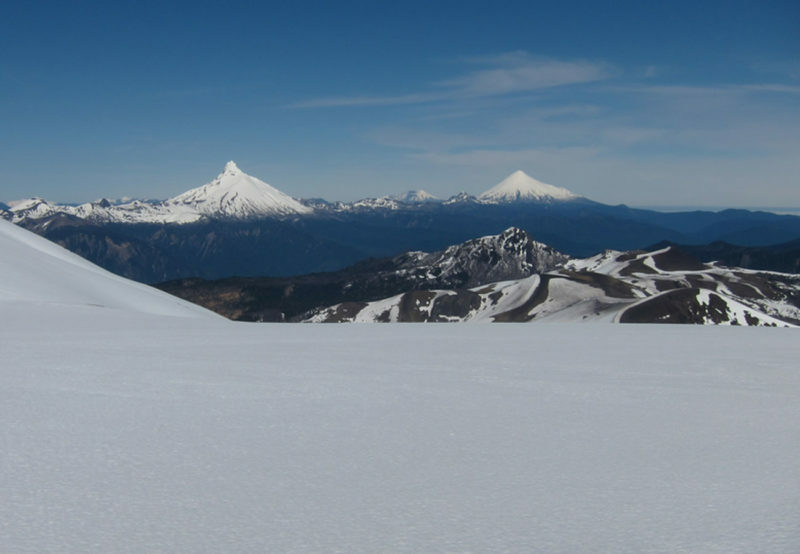 On its southern shore lies the volcano Villarica which proudly watches over the area. 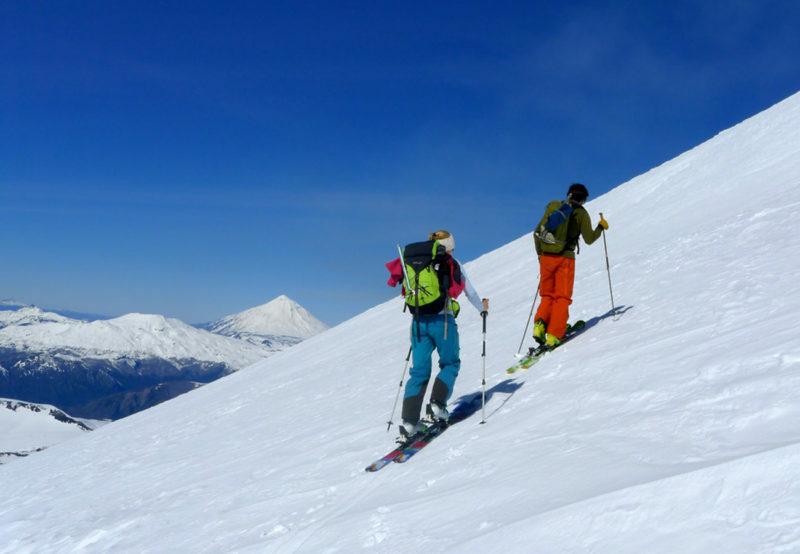 We spend the night in the small town of Pucon, the Chilean outdoor Mecca par excellence. A paradise for hiking, rafting, biking. There is a lot going on in the main street with all the restaurants and cafes. We enjoy a nice dinner with Sopa y Pilla, the typical salty pastry as Appetizer and Carmenére wine from a winery near Santiago de Chile. 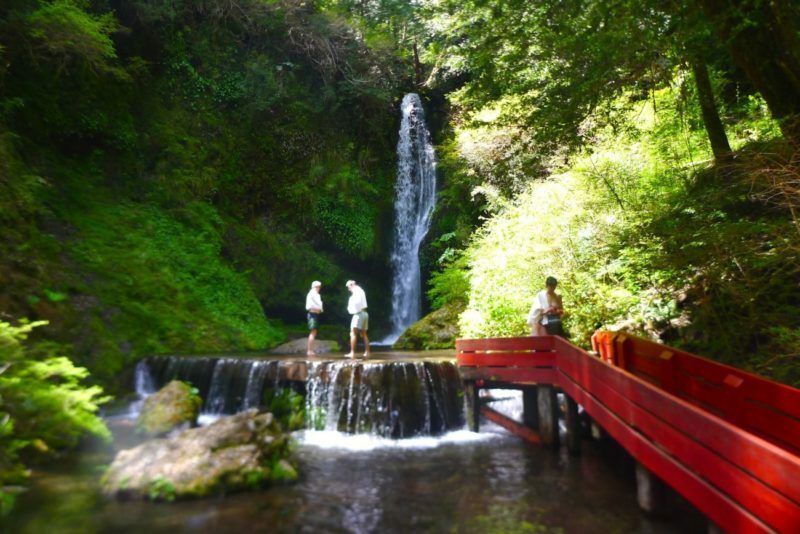 If in Pucon then you have to treat yourself to a day in one of the surrounding thermal baths. We drive on the east side of the Villarica to the Geometricas baths. These are beautifully located, hidden in a small valley. Red wooden walkways lead to the numerous pools with water temperatures between freezing cold and 39C. Large, green Nalcabättern, a kind of wild rhubarb decorate the slopes and slowly but surely the tired muscles recover. A layer of fog covers the valley floor around Pucon. All the more we are drawn up into the sky. Also the Bandurria birds (Ibis) with their loud screeching help us to exchange the bed for the ski touring skis. As hoped, we quickly get out of the fog. A huge sea of fog lies below us. 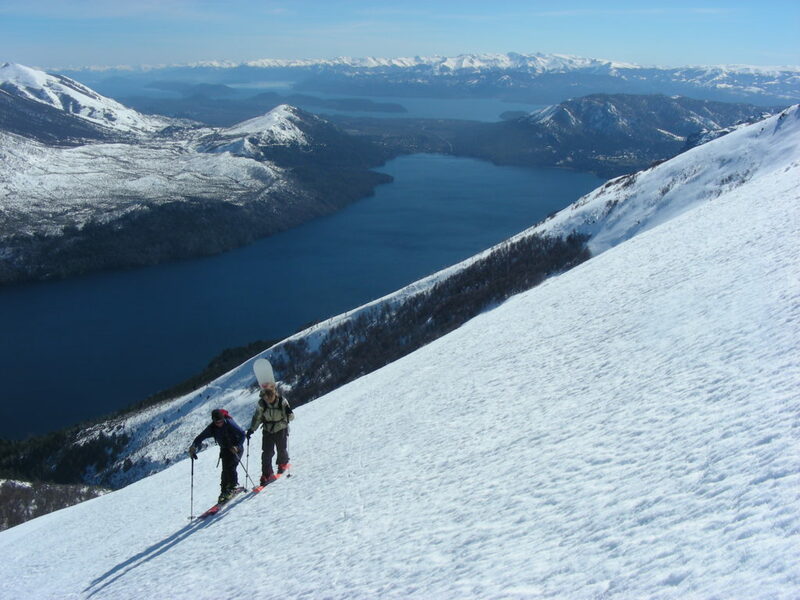 Pucon also has a small ski area from which the tour to the volcano can be started. The Villarica offers a very special spectacle. Already on its steep summit flank a wave of stinking eggs rises from time to time in the nose. We’ll soon find out where these smells come from. A huge crater opens and we can even observe the red, bubbling Lawa in its throat. 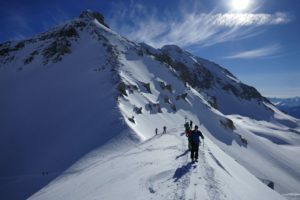 The descent from 1400m offers some ice above, then hard powder and beautiful spring snow below. When rain is announced in Chile, it is often worthwhile to change to the Argentinean sides of the Andes. So also this time. Through dry steppe landscape we drive into the so-called Switzerland of Argentina, to Bariloche. The little town is situated at the big Nahuel Huapi Lake and is very popular with tourists and athletes from all over the world thanks to its beautiful landscape. To really dive into the Gaucho world we test ourselves the next day on horseback on a ride on an estancia. We are invited by the Estancieros to a fine Asado with delicious beef, Empanadas and Malbec wine. An extensive siesta and we are ready for tomorrow’s ascent to Refugio Meiling at Cerro Tronador. In the Pampa Linda, the beautiful Pampa, our ascent begins through an impressive forest with huge Coihues trees. 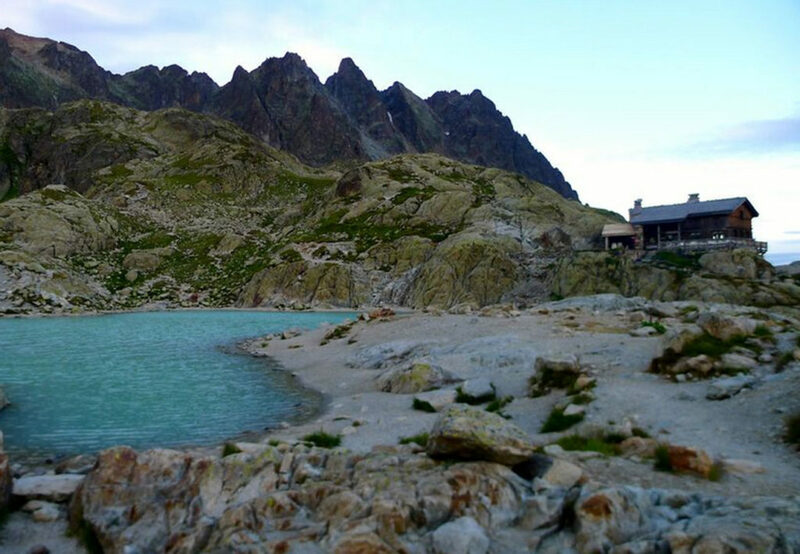 In about 4 hours we arrive at the Refugio. Lorena has already heated up and brewed coffee. She cooks a delicious lentil stew while it blows and snows outside. 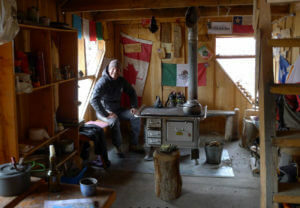 The strong winds shake the hut all night long. It only remains to hope that tomorrow it will be calmer. We almost overslept, no sound can be heard and the sun slowly rises in the distance. A splendid day without clouds and wind! 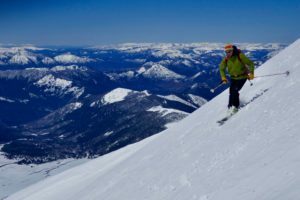 Federico, our local IVBV mountain guide from Patagoniatiptop, will take you up to the pass between the Pico Argentino and the Pico Internacional. The extinct volcano has 3 peaks. 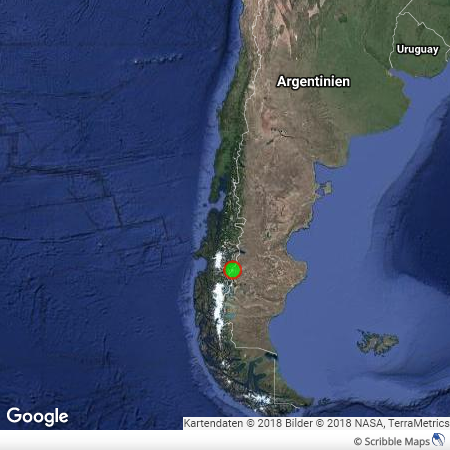 Our destination is Argentina, the Pico Chilene in Chile and the International, as the name suggests, right on the border. From the pass it goes steeply up with a short, easy climbing tour in the second degree at the very end. It’s great to be up here. If our guests had more time, we could add some more volcanoes to the program. We see the volcanoes Osorno, Puntiagudo, Puyehue which erupted in 2011 and Casablanca. 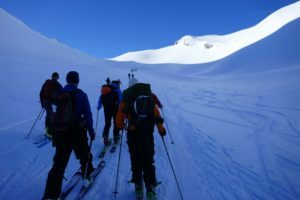 All are great ski touring mountains. After the descent and a short descent we drive through the Nahuel Huapi National Park back to Bariloche. Our guests from Switzerland fly back home in the morning. 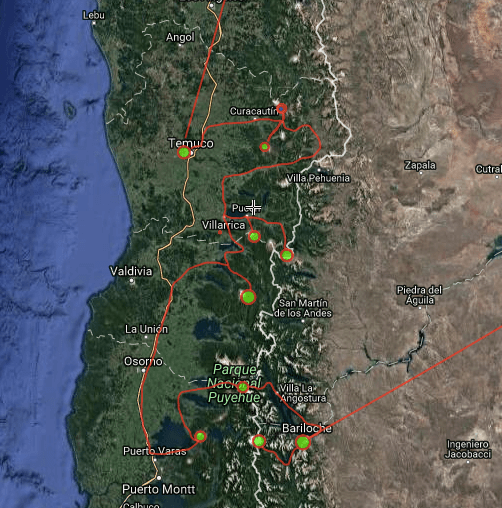 The tour can be made as a round trip from/to Bariloche or as an Andes traverse from Temuco, Chile to Bariloche, Argentina or vice versa. The airport of Temuco can be reached with a domestic flight from Santiago de Chile, that of Bariloche with a two-hour flight from Buenos Aires. 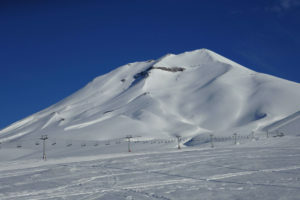 Early September to mid October are ideal for ski tours on the volcanoes. The days are longer and the climate is comparable to March/April in the northern hemisphere. 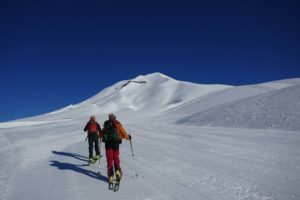 Down in the valleys it is already pleasantly warm and often the slopes of the volcanoes offer perfect firn conditions. As in the Alps, it can snow in spring. The volcanoes often surprise you with powder snow. 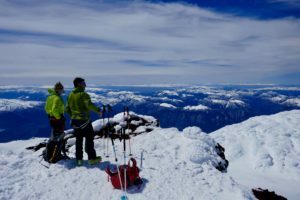 Flexibility is the magic word for a good ski tour program in this area. Depending on the weather, it can be very valuable to switch quickly from one side of the Andes to the other. Weather and conditions can vary greatly. 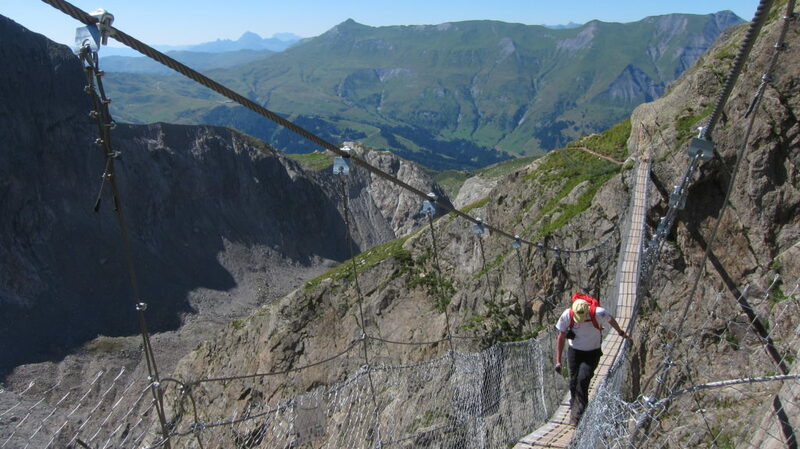 We like to keep our programs flexible so that our guests can enjoy the best descents. 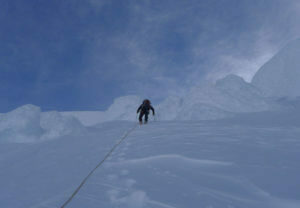 Daily ascents from 1200-1800m should be mastered. On some volcanoes you have to climb the top with crampons. Experience is required. Downhill runs in all kinds of snow with up to 40 degrees should not be a problem. 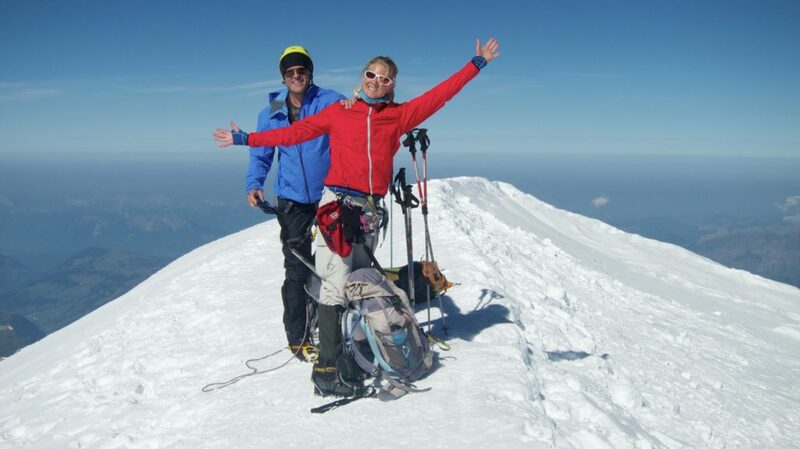 Ella Alpiger, Swiss hiking guide and snow sports teacher, owner Patagoniatiptop GmbH. For over 10 years I have been travelling back and forth between Patagonia and the Alps and have been able to turn my dream into my profession. 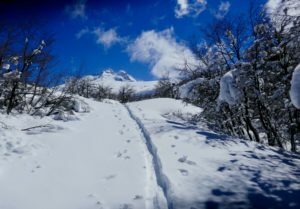 Ski touring around Refugio Frey in Bariloche is a must on a ski trip down to Argentina! The hut is legendary and the ambiance is great! 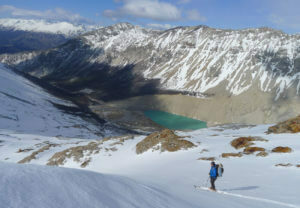 Not to talk about the great skiing options between Granite towers and mountain lagoons. Come enjoy a couple great ski days with us. We pick you up at your hotel in Bariloche and drive to the Cerro Cathedral ski area. 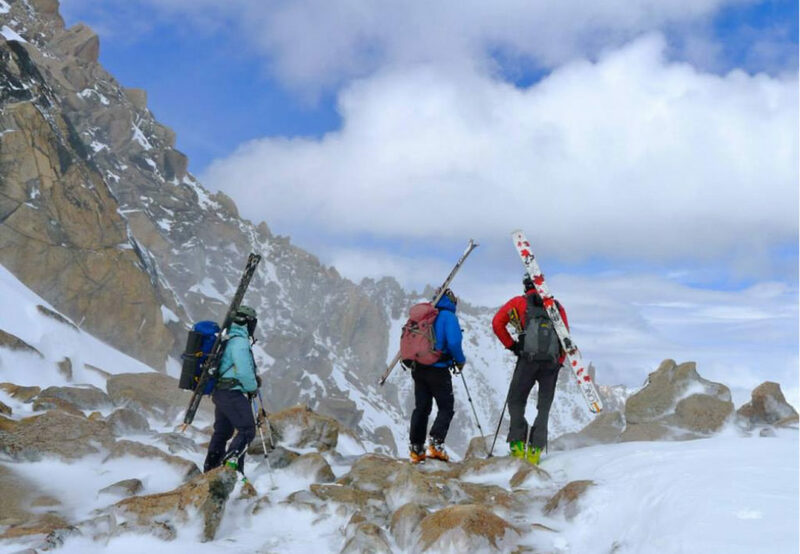 A few lifts bring us to the top of the mountain where our ski touring trip starts. 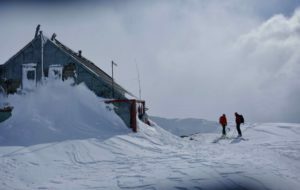 We will reach the Frey hut after a first nice run down to Vantitter valley and a short ascend up to the hut. 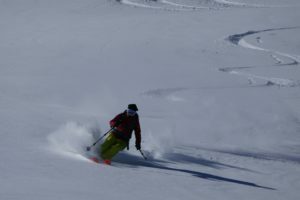 There will be plenty of couloirs with fresh snow to be discovered this afternoon. All day skiing around Refugio Frey today. We will discover mountain lagoons, ski between Granit towers and make sure you try a good Mate – Tee at the end of the day. 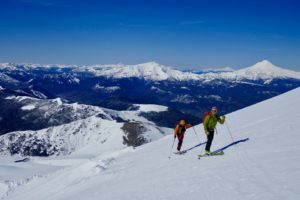 There is lots to ski still today before heading back down to Bariloche. Located on the shores of Toncek lagoon, with turquoise cold waters, at the foot of Frey peak in Mount Catedral. Named after Engineer Emilio Frey, a member of the Border Committee presided by Perito Moreno since 1895. He was the park administrator of the Nahuel Huapi National Park and one of the founders of Club Andino Bariloche. Cerro San Lorenzo is the third highest peak in the Patagonian Andes (47° 36′ S, 72° 19’W). It’s a huge mountain range that rises about 3300meters out of its surroundings. Not only its elevation is very special, also its location. 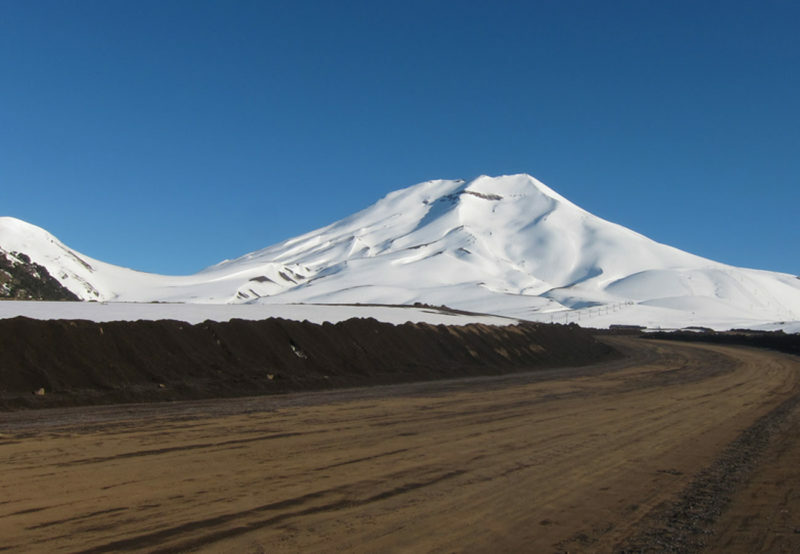 This mountain stands between the southern and the northern continental icefields and exactly between the Argentinian and the Chilenian boarder. It is surrounded by four huge glaciers. We choose the so called “routa de Agostini”, named after the first climber Padre de Agostini in 1943. 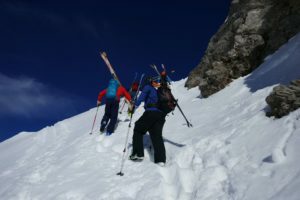 We offer this route as a wonderful skitouring expedition. Transport from Balmaceda airport to the hotel in Coyhaique. Meet and greet with the guides and the other guests. Flight to Santiago de Chile and from there to Balmaceda airport. It’s served by Latam airlines. That’s where we pick you up.